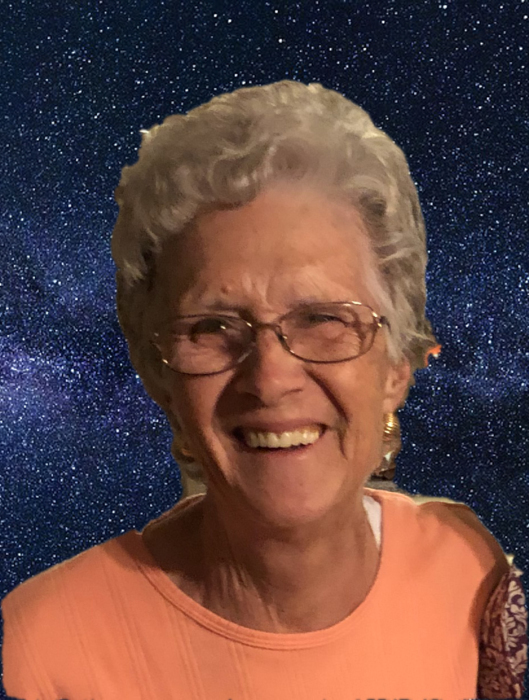 Irene Marie Jacquin departed this life on February 2, 2019 at her home. She was diagnosed with cancer in June 2018 but was determined to see her first born great granddaughter who was due in July. Delcie May was born July 10 and Irene couldn’t wait to see her. Placing that baby in your arms was a special moment. Irene blessed her family with being present at David and Wanda’s wedding in August and sharing another Thanksgiving and Christmas where she sat on Santa’s lap for a picture. Irene was born, May 9, 1941 to the late Arthur and Edna (Sanker) Roewe. She met Eugene Jacquin at Hawthorn Manufacturing in New Haven. They were married on August 19, 1960 and to this union four children were born. Irene is survived by one daughter Evelyn Jacquin of the home, and three sons Larry Jacquin and his wife Pam of Swiss, David Jacquin and his wife Wanda of Hermann and Donald Jacquin and his fiancée Tonya of Belle. Four grandchildren; Anastacia Jacquin, Cassidy Jacquin, Chase Jacquin and his wife Corina, Tyler Jacquin and his wife Alicia and two great grandchildren Isiah Jacquin and Delcie May Jacquin. Also surviving Irene is one sister Elda (Roewe) Pettig. She is proceeded in death by her parents Arthur and Edna, her husband Eugene, brother-in-law Erlloyd Pettig and a niece, Cheryl Lynn Pettig. Anyone who knows Irene knows what a hard worker she was. When she finished grade school she began babysitting and then went to work at Hawthorn Manufacturing for two years. She then went to International/Florsheim Shoe Company where she worked for 23 years before the company closed the doors. Irene went to work at Handy Pak/Stevens Manufacturing and when they closed, she decided to stay home and work with Eugene. The two become well known in the community with their ability to tear down anything. Irene’s kind heart and generosity shown through by her eagerness to care for people and she never knew a stranger. The love she had for her children and grandchildren was evident as they were the center of her world. Irene was a member of the Swiss Evangelical Reformed Church and she enjoyed and appreciated her church family very much. Memorials may be given to Swiss Evangelical Cemetery in care of Toedtmann & Grosse Funeral Home. Visitation will be held Monday, February 4th from 4:00 to 8:00 p.m. at Toedtmann & Grosse Funeral Home, Hermann. A funeral service will be held Tuesday at 11:00 a.m. at Swiss Evangelical Reformed Church, with Rev. Leon Pannkuk officiating. Burial will be at Swiss Evangelical Cemetery.